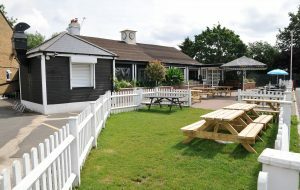 Woodies’ is an award winning, privately owned Free House tucked away in the depths of New Malden. We are a uniquely decorated venue with memorabilia dating back to the last century. Not only do we pride ourselves on the aesthetics of our pub, but we go above and beyond to provide friendly customer service and a relaxed atmosphere. We offer a wide range of drinks which include at least seven real ales, a selection of lagers and ciders, a variety of wines, soft drinks and real coffee. If it’s food you’re after, then you won’t be disappointed! Our menus change seasonally and rely on what local produce is available. We take pride in supporting the local South West community and thus source all our food from businesses in the area. Our menus are a combination of new and old – we offer both traditional pub food and restaurant-style dishes designed by our international kitchen team. For those whose favour tradition, we have a Sunday Roast every week offering a variety of meats, the tastiest roast-potatoes you’ll ever have, and even a vegetarian option to please everyone! As Sundays often get very busy, we do recommend reserving a table in advance. Open every day of the year, Woodies’ is a family-friendly venue. We welcome children and dogs alike, provided they are kept on a lead (the dogs, that is!). We have outdoor benches and a beer garden for those sunny Summer days, and a large verandah ideal for parties, a few evening drinks, or simply a meal for two. Alternatively, during the winter you can cosy up next to our fire and enjoy mulled wines and ciders. Our large premises make us a perfect venue for parties and group bookings. If you are interested, we can provide a buffet option (charged per head, or a DJ/live band for your guests. If you are interested in other services we may provide, don’t hesitate to contact us – we want to ensure your event is one to remember! Our car park has space for more than 50 vehicles – so you won’t have to stress about finding a space! For any further information, you can contact us via telephone, website or email. To stay in the loop with events and more updates here at Woodies Freehouse, like our Facebook page or follow us on Twitter. Woodies is equipped with both Sky and BT sports so you won’t miss a moment of action! We show all major sports matches and have 3 televisions to cater to everyone’s needs.